The pristine, remote beauty of a Bora Bora honeymoon is the perfect choice for a luxuriously indulgent and relaxing trip. The unspoiled beaches, the perfect blue waters of the South Pacific, and the calm pace of life makes a Bora Bora honeymoon incredible for those seeking a luxury escape. Most accommodation has been configured for privacy and luxury. When you consider these factors as well as the fact that all goods are shipped by sea or air, expect to spend at least $10,000 per week considering flights, accommodation, meals, and activities. 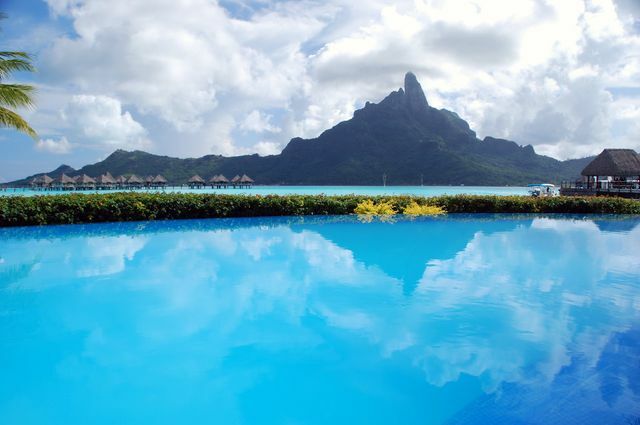 Ready to start planning your Bora Bora honeymoon? Read this first! The tropical island of Bora Bora experiences two seasons, a wet summer (Dec-March) and a dry winter (June-Oct). However, summer temperatures range from 85 to 87 degrees, while winter temperatures are an agreeable 82 to 84. The drier winter is a considerably more popular time to visit, though don’t expect low season discounting anywhere in French Polynesia. Most Bora Bora honeymooners will arrive by air via Papeete (Tahiti). The island caters to luxury travelers seeking exclusivity and the exotic with world class resorts and gourmet dining. Most activities center on the beach, including snorkeling, diving, jet skis, and yachting. Most come to relax and recharge, so bringing some books is highly recommended. The island is small at 12 square miles and can be easily explored in a day or two via a rental car, bicycle, or a private tour. Shopping is limited to small grocers, souvenirs, pearls, and handicrafts/art, so come with a focus on relaxing. The breathtaking, untainted, and timeless beauty of your destination make Bora Bora honeymoons among the world's more desirable. Beaches: You’re spoiled for choice during your Bora Bora honeymoon, though the best beaches are concentrated at the southern end of the isle around Matira Point. The Lagoonarium: The Bora Bora Lagoonarium leads guided diving tours allowing visitors to come face-to-face with turtles, stingrays, sharks, and other aquatic life. There is also the option to go under in a small submarine. Jet Skiing and Boating: Exploring the lagoon by jet ski or boat is a great way to go around the island at your own pace. Scuba Diving: The calm, clear water is perfect for scuba divers. Walks and Hiking: The small island offers great options to explore by foot, including hiking up Mt Pahia if you’re feeling intrepid. Crafts and Pearls: Small shops of the traditional and modern variety are available to sell locally made Polynesian handicrafts and world-renowned black pearls. Jeep/Off-Road Tour: A jeep with a local driver will take you to some of the best vantage points on the islands not accessible to visitors in a rental car, and history buffs will love the ruins of the US WWII constructions such as bunkers and gun embankments. Yacht Charter: For the more ambitious, Bora Bora offers a great base to charter a yacht and explore French Polynesia at your pace. Roulette: Not the game! These are small roadside eateries offering inexpensive, local dishes blending French and Polynesian culinary influences. Visit Vaitape: If you need a break from your resort, the town of Vaitape is worth a visit for a change of pace and perhaps a café visit. Whale Watching: Unlike most whale watching sailings, whale watching during your Bora Bora honeymoon is often a small, bespoke outing involving snorkeling – seeing the whales underwater is unique and unforgettable sight. Shark Diving: Those who are feeling brave will enjoy going out into open water to swim with sharks and stingrays. Anyone been to bora bora or is going there for their honeymoon? We're looking into that for our honeymoon and would love some recommendations and suggestions! Thanks!